Stamp a Blessing: Make it Simple Monday! Hope you are having a wonderful July 4th celebration or at least take some tme to relax, spend time with family and stamp! Hehe! "Make it Simple Monday Tip"! Yay! Mondays tend to be hectic in the Urrutia family (WHY! ), so many little things to do. They tend to be Messy Mondays. Thou surely we can find the beauty in these days too, right? There IS beauty in the messes of life. It simply means we are alive and in the process. I do NOT want stamping to be difficult for you by any means. So I decided to give you little hints that will make your creative life easier. 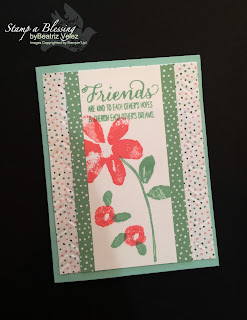 My friend and demonstrator Beatriz Velez shared this card with me a few days ago. And I simply LOVED IT! There is no better compliment in my opinion, than to CASE a card. Meaning copy all share everything. So I decided to do it with this card. If you come back today a bit later, I will be showing MY OWN card with this sketch. No science required. It will be on my blog. 1. Cut you card base to 5 1/2" x 8 1/2". Then fold in half lengthwise to 5 1/2" x 4 1/4". Her card base is Mint Macaroon. Lovely! 2. Cut a piece of 6" x 6" at the 3 3/4" mark, then the remaining piece in half, at 1 1/4". 3. Adhere your bigger piece to your card base, then your two strips (showing the design of the paper in the back) as shown to leave some space on the sides. 4. Cut a piece of Whisper White card stock to 5 1/2" x 2 3/4". 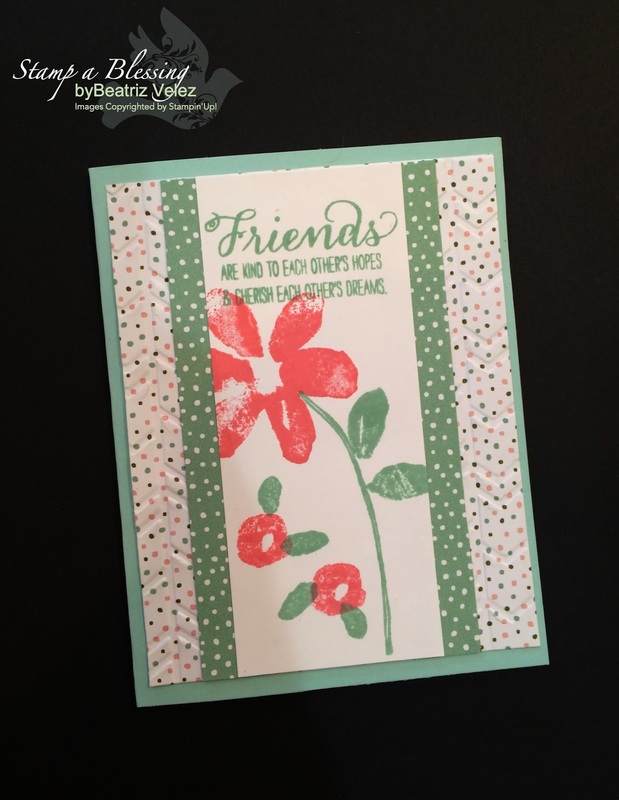 This is the piece you will use for your stamping. Stamp on it as shown with any of your stamp sets. 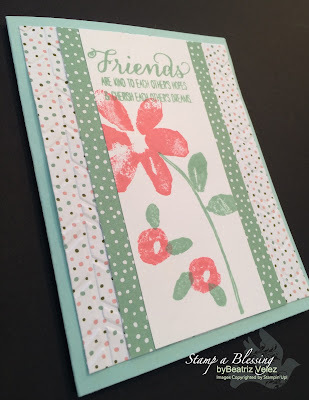 Beatriz used Garden in Bloom (page 146 of your Stampin'Up! Catalog). This is an easily duplicatable card, and I lOVED it! My friend Beatriz is one of my newest downline and I feel so proud of her creativity! Thanks Bea for sharing your beautiful life with me! So happy to call you my friend. Now I CANNOT wait to see what YOU make with this sketch. Please please, show it to me…I may throw a little giveaway to raffle between all who share with me. Gotta go workout! Is time to be diligent in all the things the Lord puts in our hands to do. Have a blessed Independence Day celebration! 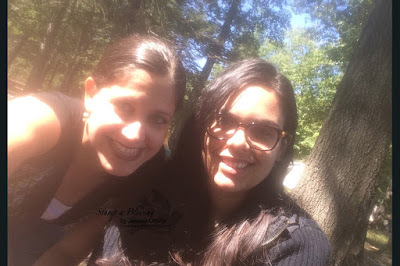 This is Beatriz, my friend and I! 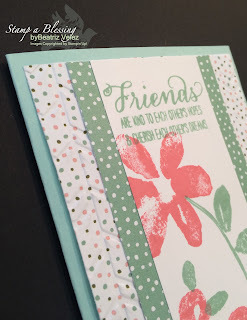 and make your stampin' simple! Awww Donna!! You are sooo special to me. There is no other like you sweet friend. Can't wait for OnStage to see you again and share!! Tx for leaving Bea and me loveee! This is such a beautiful card! And the technique looks great, too! Thanks for sharing. Looking forward to seeing your version of it, too.